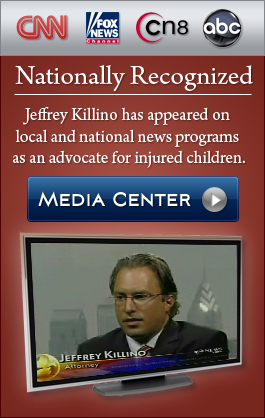 Jeffrey Killino is a nationally-recognized child injury attorney known for his tireless work on behalf of injured children and their families. Fiercely dedicated to protecting the rights of injured children, Jeff fights for two causes: to achieve justice for children who have been hurt, and to ensure the safety of children in the future. As a fearless advocate for injured children nationwide, Jeff Killino meets the challenges of child injury cases head on. When millions of children were put at risk by lead paint in Mattel toys, Jeff filed suit against Mattel to force the company to finance lead-testing procedures for affected children. His efforts have garnered the attention of the national media, including the Wall Street Journal, New York Times, The Washington Post, CNN, ABC News, Fox, and many others. To child injury attorney Jeff Killino, there is nothing more important than the safety of innocent children. He is prepared to take on any opponent, anywhere in the country- from powerful corporations like Mattel, to negligent hospitals, to manufacturers of defective products. No case is too big or too small – if your child has been injured, Jeff Killino will investigate the circumstances, evaluate your case, and help you decide if taking legal action is appropriate. From school bus accidents, to hospital error, to recalled cribs or car seats, Jeff Killino is the trusted advocate your family needs. His years of legal experience, familiarity with critical child safety issues, and knowledge of important disciplines such as engineering and medicine equip him to handle any child injury case. Jeff is also a Board Member of the United Cerebral Palsy Association. When investigating the cause of your child’s injuries, Jeff spares no expense and leaves no stone unturned. Thorough and dedicated, he works alongside nationally-respected experts to ensure the success of the cases he handles. His efforts are often of national – or even international – consequence; one of his investigations prompted the National Highway Traffic Safety Administration (NHTSA) to recall thousands of dangerous Chinese tires found on minivans, SUVs, 18-passenger vans, and other vehicles commonly used to carry children. 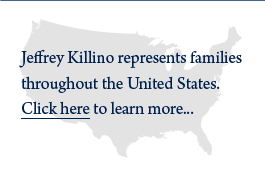 Jeff Killino handles cases from all over the United States, in every state and city. Though supported by a team of lawyers and staff at his home office in Philadelphia, as well as a national network of experienced attorneys, he upholds a personal commitment to be fully and personally engaged with each case and every client. He will never allow your case to be passed off to a paralegal, or even another lawyer. He will be at your side from start to finish, and is always available to address your concerns, return your calls, and answer your emails. In all aspects of his law practice, Jeff is diligent, prompt, and aggressive, while remaining highly sensitive to the unique needs of each individual child, and of each family’s need for privacy. Jeff knows that child injury cases are never about the money – but he gets results anyway. His achievements have made him a member of the Million Dollar Advocates Forum and brought him recognition by Super Lawyers magazine. Jeffrey holds a Masters degree in Trial Advocacy, has secured numerous million-dollar recoveries, and is equally adept at arguing a case before judge and jury, or negotiating a timely settlement. As your attorney, Jeff Killino respects your intelligence and your right to know what’s going on in your case. If you ask a question, you will receive a straight answer in language that you understand. For a free and immediate consultation, contact him at 877-875-2927. If your family is facing a catastrophic emergency – wherever you are, Jeff Killino will be by your side to get you the answers you deserve.